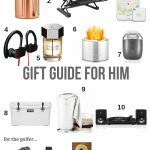 Between shopping, decorating, parties, traditions, baking, traveling and more, the holiday season can quickly escalate from enjoyable to stressful for us. And now that our minis are at an age where they are excited for Christmas I want to make sure we make it as meaningful as possible without overextending ourselves (I’m looking at you, Elf on the Shelf). So this Christmas I’m hoping to implement just a few new traditions and continue some old traditions that require minimal effort but still excite our kiddos and provide a good mix of Jesus and Santa! 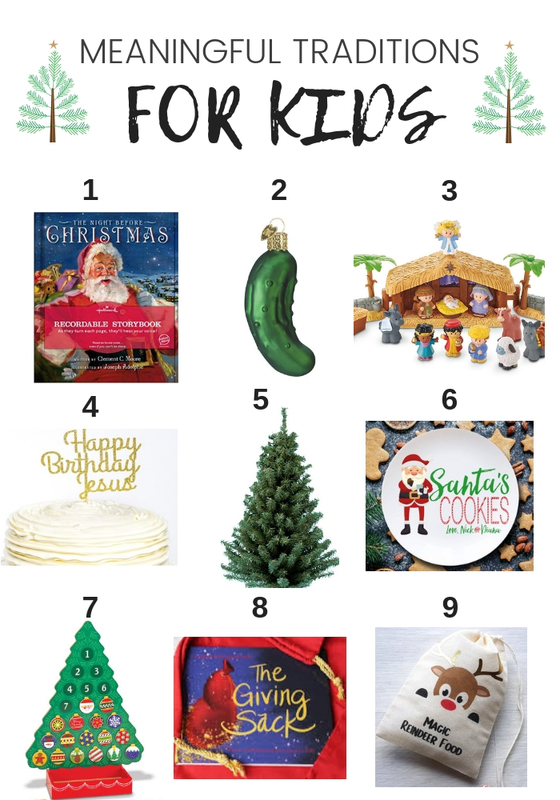 So today I’m sharing a few simple Christmas tradition items you can use throughout the season with your children. 1. 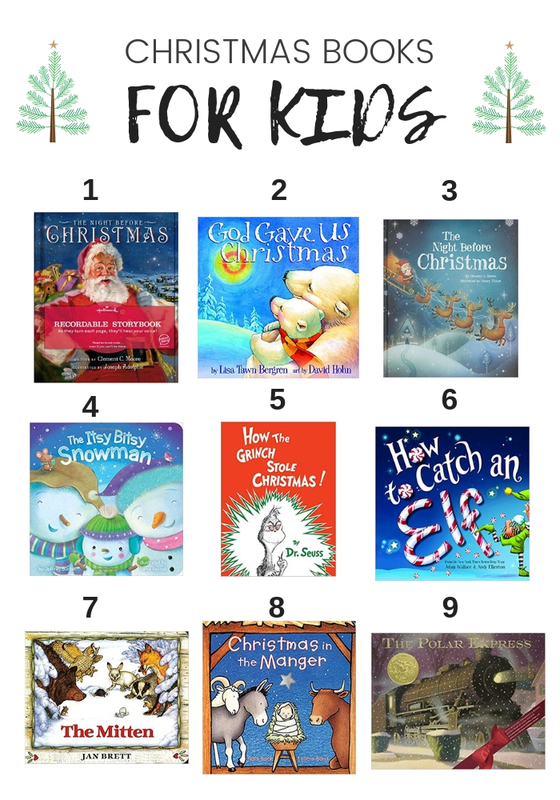 The Night Before Christmas Recordable Storybook: Hands down, my favorite item on this guide. Last year all of the grandbabies received this storybook from my dad. Hearing his voice telling the The Night Before Christmas is one of the most special gifts that we’ll cherish forever. This is the perfect gift for grandparents to give their grandbabies. It’s also the very first thing I tell my friends and readers to get when they are close to losing a parent to have for their kids or future kids. 2. Pickle Ornament: If you don’t already have a pickle ornament for your Christmas tree you need one! The person to find the pickle hiding in the tree on Christmas morning gets to open the first present. 3. Fisher-Price Little People Nativity Set: A super simple way to break down the Christmas story for little ones. Both of our kids love this set. This is also a GREAT gift for baby’s first Christmas!! 4. Birthday Cake: Each year we throw a little birthday party for Jesus with a cake or cupcake and sing “happy birthday” with the kiddos. 5. Mini Christmas Tree: Last year a note was sent home with both Thomas and Caroline’s daily report cards asking parents to consider putting a small Christmas tree in their kids’ bedrooms this year. Each year it’s encouraged to add a new ornament so that one day when our kiddos go off to college they have a small tree with lots of meaningful ornaments of their own. Cue the tears. 6. Cookies & Milk for Santa: Growing up we always set out cookies and milk in front of our fireplace for Santa as well as some carrots for the reindeer. I love this special little set! 8. The Giving Sack: A storybook authored, illustrated and self-published by Leanne Hill to cultivate a philanthropic mindset in our kiddos by teaching them how the holidays are also a time to be grateful and generous. 9. Magic Reindeer Food Bags: Last year one of the little girls in Caroline’s class gave all the classmates bags of “magic reindeer food.” I thought this was the cutest idea and we loved sprinkling it in the yard on Christmas Eve! Reindeer food is a mix of oats and glitter which makes for an inexpensive gift idea if you’re trying to gift a class full of kids something at Christmas. 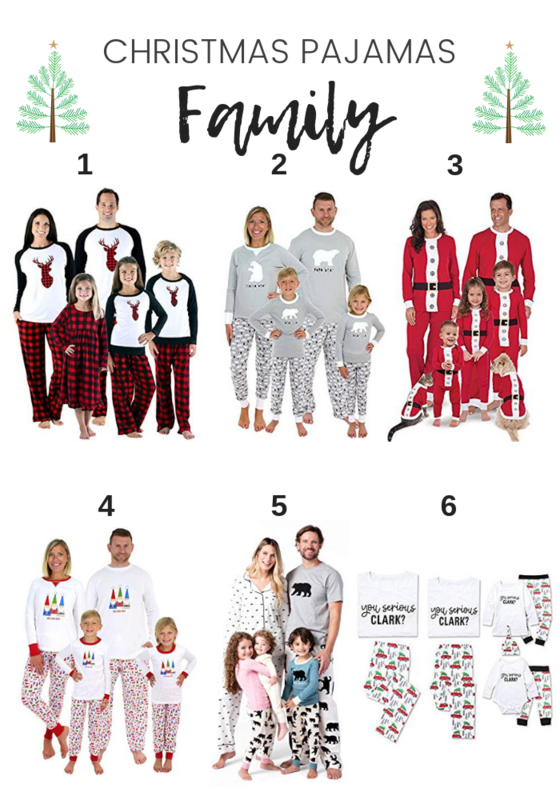 You can find a lot more of my family pajama set picks HERE! Want some additional tradition ideas? 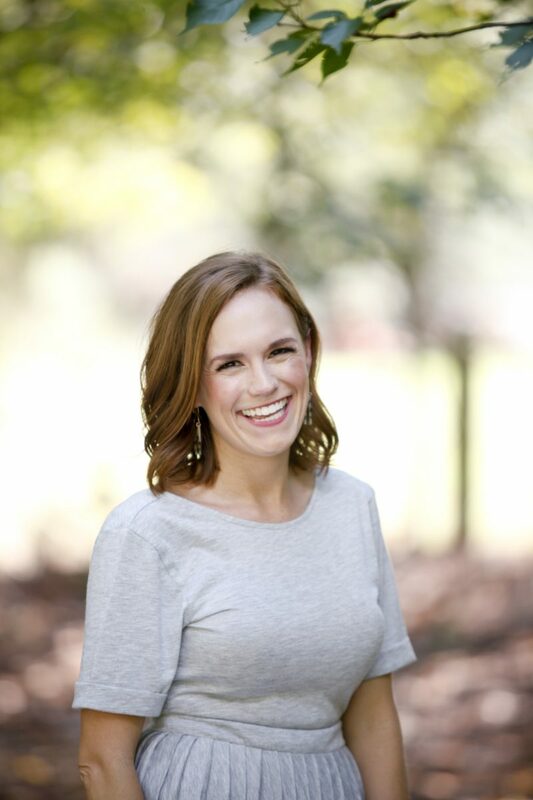 Check out my previous post on meaningful holiday traditions! Love these! Lawter loves her personal mini tree- I need to find one for Tell now! I've been looking for a good advent calendar that will be something to look forward to doing with them too- we had one grown up (and now fight over who gets it for their house eventually) where you move the bear on Velcro through the rooms in the house looking for Christmas. : ) and I love that nativity set and think L might be old enough this year to start getting some meaning from it so just might have to pull the trigger on it. Thanks for sharing and have a great Thanksgiving with the fam! Every year for Christmas, my parents gave me an ornament when we decorated our tree – always some kind of angel. When I finally moved completely out of my dad's house after grad school, I had a box full of beautiful ornaments from them as well as some given to me by my grandparents. Now, my fiancé and I decorate our own tree with my ornaments and those given to him by my parents as well. It's really special! I love these ideas, with two littles under 3 in the house, we are trying to set in place ways to incorporate traditions. I love the small nativity scene and also the advent idea. We do pj's 🙂 I also heard about instead of elf of shelf, the elf of kindness or the kindness nativity (looking into). Thanks for the ideas! Love the mini tree idea! Growing up I received special ornaments from my mom, grandmother, and godmother every year and now I have so many beautiful ornaments to fill my own tree! A lot of the ones my mom got me would be related to something from the past year (i.e. a New York City ornament to remember our first trip to the city together). I love looking back on so many memories while hanging the ornaments on my tree! Such fun ideas! I really want to get both of my girls involved in giving back this season. They’ll be 5 and 2.5, so I think they’re at an age where they can start to be involved somehow and learn to appreciate all we are so grateful to have, especially during the holiday season. Thanks for sharing! I love all of these ideas! It’s our first Christmas as parents so I’ve been trying to think of traditions and special things to implement in the years to come! Great ideas! We do several of them. I’ve heard of the pickle on the Christmas tree but have never tried that one. I gotta say though, the Elf on the Shelf gets a bad rap ha! The kids are soooo excited to look for him every morning and they’re even thrilled with finding him sitting in the doll house or literally on a shelf. ? It doesn’t have to be as involved as some families make it. I never thought I would be a fan of it, but the things we do to see our kids smile, right?! I took your advice and got a mini Christmas tree for my three year old son. It’s the best money I have ever spent. He lit up when he found out he had a Christmas tree just for his room and LOVED decorating it. I love the idea of picking out a special ornament every year for him. This comment seriously just made my day!! Thank you for sharing!!! Love this special memory for y’all!